Photographers across the UK are invited to enter their best images of the ecology of wreck sites. The wrecks can be submerged, intertidal or coastal. The judges are looking to find the image which best captures the relationship between wreck sites and ecosystems. Entrants are also invited to tell us about their image and about the heritage and ecology on their site, where and what the wreck is, and a bit about their favourite wreck and why it’s their favourite. The winning image will be shared and promoted by Historic England , MSDS Marine and Carcinus via their social media outlets. Wherever Historic England, MSDS Marine and Carcinus use the image the photographer will always be credited. The winner will also be awarded a £50 voucher kindly donated by Go-Dive, to use in store or online. This competition is being run as part of an Historic England-funded project which is investigating how to integrate cultural heritage with the ecosystems services approach to managing land, water and resources. A vital part of this integration is understanding the relationships between cultural heritage and ecosystems, and recognising that how people value and use sites is important and should be drawn into management. 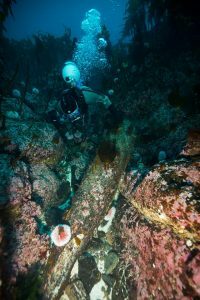 We will use all images and information to identify the ecological diversity of wreck sites, and to understand how and why people value different wrecks. To enter, or for more information, please contact Sally Evans (sally@msdsmarine.co.uk). Entries will be judged by Historic England, MSDS Marine and Carcinus. Entries should be sent to Sally Evans no later than the 15th August 2018. Entries may be shared on social media channels. Images should be in jpeg format and filenames should include the name of the photographer. Photos must be taken in UK waters/ intertidal zone.